What happened to winter tires? Thirty or forty years ago everyone switched over to winter tires sometime after Thanksgiving. But today, many drivers stick with their all-seasons. At Budds’ we think that’s a mistake—and here’s why. Winter tires are pretty recognizable, and not just because of the mountain and snowflake symbol on the sidewall. The tread pattern is different to what you see on all-season tires. There’s more gap between the blocks of tread because that clears snow better, and there are fine cuts or “sipes” in the rubber. These provide additional edges to bite into packed snow and ice. That’s important, because according to Statistics Canada, the Oakville area receives an average of 115cm of snow a year—and that means a lot of time spent driving on the slippery white stuff. But the biggest difference between winter and snow tires though is the one you can’t see. They’re made from a different kind of rubber. Rubber gets hard at low temperatures, so the stuff used in winter tires is specially formulated to stay soft in cold weather. Why is it important that rubber stays soft when it’s cold? Quite simply, softer rubber grips a dry surface, while hard rubber tends to slide over it. That grip is essential for acceleration and cornering as well braking, so softer tires do a better job of getting you going and keeping you safe. So why not use softer tires all the time? Well, you could drive on soft tires all year-round, but as the weather warms up the rubber gets even softer. This has two consequences. First, softer rubber moves more as the driver turns the steering. That translates to a squirmy, imprecise feel that drivers don’t like. And second, softer rubber wears faster. Use your soft winter tires in summer and they’ll need replacing pretty quickly. So, if hard tires don’t grip in winter and soft tires wear out in the summer, what’s a tire buyer to do? Enter the all-season tire—made from rubber that stays pliable at low temperatures but doesn’t soften too much in hot weather. In other words, a compromise between what you want on your car in winter and in summer. 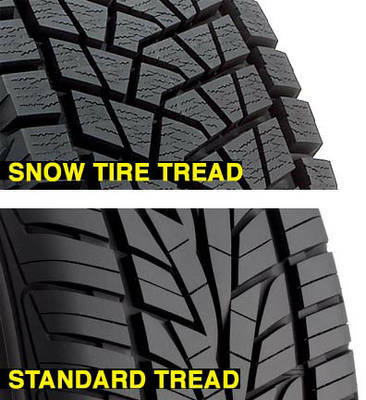 Similarly, the tread pattern on an all-season has more gaps than a summer tire, so it can clear snow if it has to, but doesn’t grip as well in dry weather. Overall, all-season tires do an okay job in summer and winter, but not a great job in either. An aggressive tread pattern gives winter tires more grip than all-seasons can provide on snow and ice. That’s good, but particularly if you live in the city you may wonder if it’s something you really need. Well here’s the thing: while snowfall is unpredictable, you can be sure that winter will be colder than summer. And since winter tires are formulated to grip better in those low temperatures, that means more traction when moving away from the lights and going around corners. Most important though, it means shorter stopping distances—the kind of difference that could save a life. Incidentally, if you’re thinking about putting snow tires on only your driven wheels—just two on the front for a front-wheel drive vehicle, for example—watch out. While the additional grip will help with pulling away from traffic lights, it will create instability when cornering and braking. For that reason, always fit four winter tires at the same time. What about all-wheel drive instead? Many Canadians chose vehicles equipped with all-wheel drive. AWD definitely helps you get going in slippery conditions but isn’t a substitute for winter tires. Modern AWD systems send power to the wheels with most traction, but that doesn’t help if the tires can’t bite. For the best grip, combine AWD with good winter rubber. With winter approaching it’s essential you make sure your vehicle is prepared. All-season tires do an okay job of handling snow and ice but winter tires will keep you safer. And remember, when the road gets slippery stay even further back from the car in front than you usually do. That’s why wise motorists see winter tires as an investment and not a cost. However, that doesn’t mean you can’t save some money on that investment. In fact, at our Budds’ Fall Tire Event, you can save up to $125 on the price of a set of tires. Act now before temperatures drop—or you’re too busy shoveling the driveway.